My sister has a pair of newborn-sized ballerina slipper socks that she loves putting on her daughter, even though her daughter is now six months old. 😀 Since they’re both coming to visit in a couple of days, I thought I’d try making her a pair of baby ballet shoes. I used Me Sew Crazy’s tutorial and pattern, which was very good, but I’m not so handy at sewing such eensy, fiddly curves. 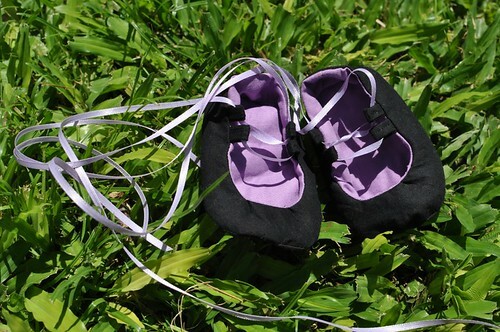 I’ve definitely got sewing baby shoes out of my system, now! I tried to get Sunshine to model the shoes for me, but his feet are too big. I hope Dawnybear’s feet are a lot smaller! Reminds me of the story of Cinderella.